Former Chelsea midfielder John Obi Mikel is reportedly undergoing a medical with Championship side Middlesbrough ahead of his proposed switch from Tianjin TEDA. 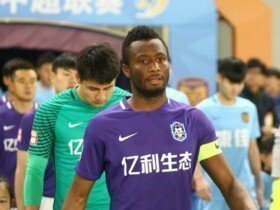 The Nigerian has been plying his trade in the Chinese Super League for the past two years but he has now agreed on a short-term move to Boro, who are vying for promotion to the Premier League. According to Evening Standard, the former Blues star has already agreed a financial package with Tony Pulis' side and his move will be finalised once his medical is concluded in the next 24 hours. Middlesbrough have been lingering in the playoff positions for most of the current campaign but they will be hoping to step up their performances during the remaining months to push for the automatic promotion spots. Boro are currently fifth on the table with 47 points, six behind Norwich City, who are occupying the final automatic promotion place. The Riverside outfit entertain Newport County in the FA Cup fourth round this weekend.